Scientists working for NASA are looking into techniques to prevent the body from breaking down muscles strong during long space journeys. Supplementation with fish oil and curcumin supplementation is perhaps such a technique, although the effective doses are dangerously high. 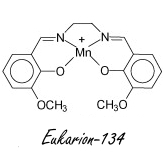 The synthetic super antioxidant Eukarion-134 may be more interesting. The experimental design of this study, which has been published in Experimental Physiology in 2018, resembles that of the fish oil-plus-curcumin study we wrote about a few days ago. It was conducted by the same researchers. The researchers made it impossible for a group of rats to use their hind legs, and then determined the effect of 7 days of inactivity on the calf muscle soleus. Some of these rats received Eukarion-134 [HU+EUK-134], others did not [HU]. Rats in a control group were able to use their hind legs during the study [CON]. Eukarion-134 is a synthetic substance that mimics the action of the antioxidant enzymes super oxide dismutase and catalase. We do not know any preparations intended for humans, and as far as we know supplements and medicines with Eukarion-134 have not yet been tested on humans. However, there are some cosmetics with Eukarion-134 on the market that should delay skin aging. By administering Eukarion-134, 7 days of inactivity did not resulted in degradation of the soleus. Inactivity inhibited the activity of anabolic signal molecules, as shown above. That did not happen or to a lesser extent if the test animals had received Eukarion-134. Physical inactivity increased the activity of free radicals, analysis of the muscle tissue of the test animals showed. Those free radicals sabotaged the anabolic signalling pathways. Eukarion-134 reduced free radical activity, thus maintaining anabolism in the muscle cells. A few days ago we wrote about the effect of fish oil and curcumin supplementation on inactive muscles. In an animal study, these two substances practically halted muscle degradation due to inactivity, but this required doses that were not realistic. In this study the test animals received 3 milligrams of Eukarion-134 per kilo per day. The researchers injected the superantoxidant directly into the small intestine of the rats. The human equivalent of that dose would be 30-40 milligrams per day. An oral dose, we estimate, would amount to 60-80 milligrams per day. Well... At least it fits in a capsule. Exp Physiol. 2018 Apr 1;103(4):545-58. If you do not use your muscles, your body breaks them down. Fish oil and curcumin supplementation can inhibit or maybe even stop this breakdown. The dose required for a muscle building effect is higher than the 3 g recommended generally by supplements experts. Broken your arm recently? Has an injury stopped you from training for a while? Or just no time to train?